Two more goals for ‘Biggsy’. 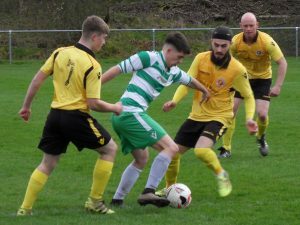 The Saints ran out comfortable winners this afternoon against a battling Dolgellau FC. 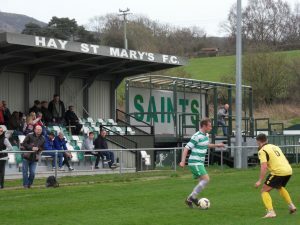 On a roasting hot day the Saints took control of the game from the off. 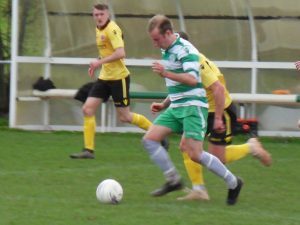 Striker Matty Tong opened the scoring in the 14th minute, a Brendan Hackett corner was cleared to the edge of the area where Tong drilled it into the bottom left corner 1-0. 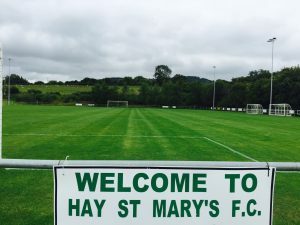 Top scorer Jack Biggs added another to his seasons tally to put us 2-0 up and youngster Liam McNally got on the score sheet again netting the third to see ‘The Saints’ go in at the break 3-0 up. ‘Dol’ had a chance early in the second half to pull a goal back which could of changed the outcome of the game but the chance went begging! The Saints got a bit sloppy resting on their laurels with a three goal lead. 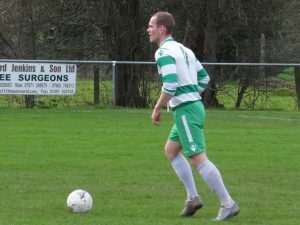 Striker Greg Preece finished off the scoring with the sixth of the game in our final league home game of the season. 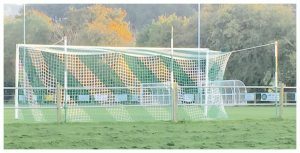 The first team play their last home league fixture of the season tomorrow when they host Dolgellau FC. The first team match has been kindly sponsored by Jamie Evans. There is a race night after which has been organised by first team manager Gareth Jenkins. 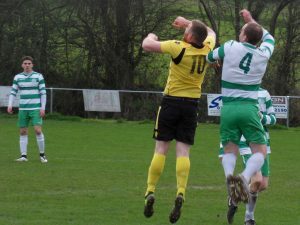 The reserve team won 4-2 yesterday against visitors Newcastle Upon Clun FC. 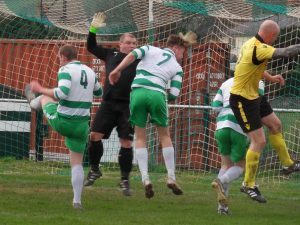 Harry Ratcliffe netted a brace, Darren Horrigan(1) and youngster Jack Cook scored from the penalty spot. 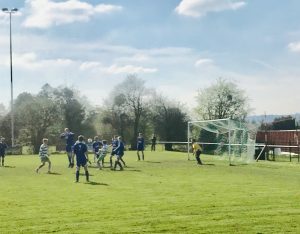 The Saints beat a depleted Machynlleth FC side 8-0. 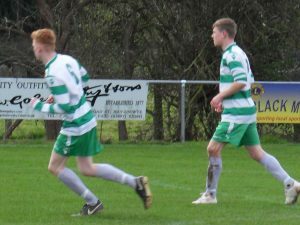 The goals were scored by Jack Biggs(3), Liam McNally, Matty Tong, Greg Preece, Will Goodwin and Harry Hooper. 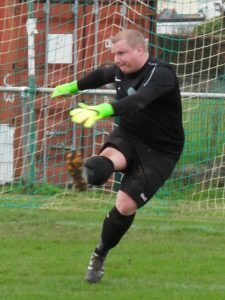 We started sloppy and could of been a couple of goals down if it wasn’t for keeper Tom Bevan, the one a great save when the Machynlleth number 9 was in on goal. After a few words from the sidelines we upped the tempo and soon went 1-0 ahead from the impressive Liam McAnally who headed in a rebound. 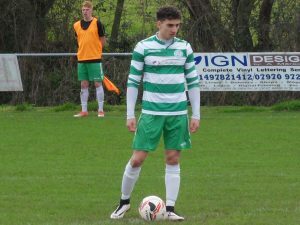 Top scorer Jack Biggs took centre stage scoring with his head to double our lead (2-0), before netting two more which were both flagged offside. Biggs did score his second just before the break to put us 3-0 ahead, that was also his 30th goal of the season in all competitions. 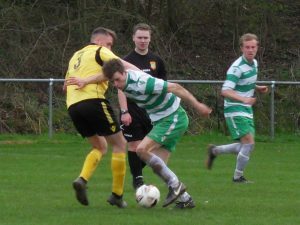 ‘Mach’defended well for the next fifteen minutes but were opened up when Callum Maddy slipped a ball through for Matty Tong to run on to, the striker scoring from the edge of the box to make it 4-0. 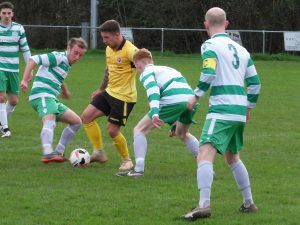 Biggs finally got his hat-trick scoring from close range for 5-0, a well worked goal saw striker Greg Preece finish well with a first time shot for 6-0. 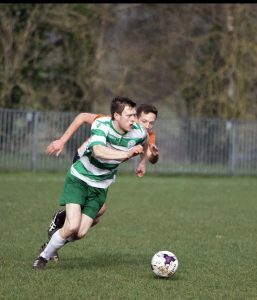 Captain Will Goodwin started a move out on the left, after several passes it found Tong on the right he crossed the ball in first time to Goodwin who smashed it home from 16 yards for 7-0. 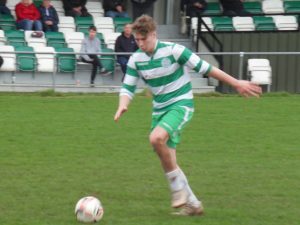 Youngster Harry Hooper showed quick feet to get on a loose ball to finish off the scoring blasting past the busy Mach keeper. To their credit the visitors battled from start to finish with several first teamers missing but ran out of steam in the second period. I thought we over played it early on instead of getting the ball forward quicker, once that was sorted we played well. A second clean sheet for the defence and a special mention to keeper Tom Bevan who pulled off an incredible save on 70 minutes to deny the visitors a goal. 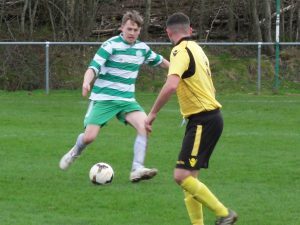 Youngster Liam McAnally had another excellent game but it’s hard not to give the man of the match award to hat-trick man Jack Biggs. 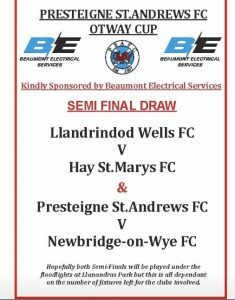 The first team play host to bogey side Abermule FC tomorrow in a league fixture. 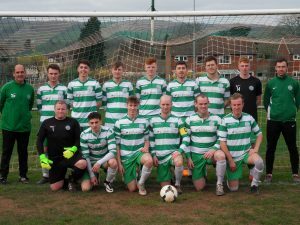 The reserves are away at Presteigne in the quarter final of the league cup. Both first team and reserve team games are OFF tomorrow(Saturday) due the bad weather causing waterlogged pitches. Today’s first team game v Dolgellau FC is OFF due to a waterlogged pitch.